Gaithersburg, MD, Feb. 12, 2009 ...updated June 24, 2009 – Anthony F. Hitchcock, a national figure in horse show management, was named Chief Executive of the Washington International Horse Show (WIHS), a major equestrian event based in Washington, D.C. Since 1978, Hitchcock has held leadership positions with a number of major national horse shows. For 28 years, he and Jean Lindgren, his wife and business partner, were the Executive Directors the Hampton Classic Horse Show in Bridgehampton, NY, helping to grow it into one of the largest hunter/jumper horse shows in the country with 1,500 competitors. With close to 50,000 spectators annually and contributions of more than $1.2 million to its beneficiaries, the not-for-profit event is considered a model for events that combine sports and a strong social component. Since 1993, Hitchcock has worked closely with HITS, Inc. (Horse Shows in the Sun), producer of horse show circuits in Thermal, CA, Ocala, FL, Culpeper, VA, and Saugerties, NY, serving initially as National Marketing Director and since 1999 as Senior Vice President. Hitchcock also served as Director of Equestrian Activities for the 1989 World Cup Equestrian Festival in Tampa, FL, and Producer of the National Horse Show at the Meadowlands (NJ) from 1992-1994. Hitchcock will continue in his role as Senior Vice President of HITS. “The Washington International is a cornerstone of equestrian competition in the U.S.,” said Hitchcock, 68, of Sagaponack, NY. “For decades, the Indoor Circuit has been the engine driving horse show competition from coast to coast. Horse trainers and their customers work hard each year to qualify to show in this prestigious event that generates more than $7 million in economic impact to the District of Columbia each year,” he said. 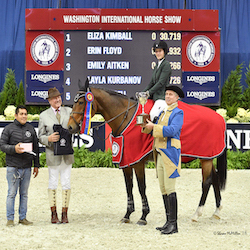 “Our immediate goals for 2009 are to continue the event’s proud traditions while reaching out to the city and community to build new business relationships that will benefit both the horse show and the greater Washington region. Hitchcock’s multifaceted career also includes 12 years as an educator and administrator, and with Lindgren, he and his wife authored six regional guidebooks on country inns, lodges and historic hotels of the United States and Canada.